"Drew Collins is made in and inspired by Puget Sound. He was born and raised around the beautiful mountains, valleys, lakes, rivers and streams that support life in this area. Growing up hiking, biking, swimming, traveling all over the region has made him an advocate for a cleaner and healthier environment. He volunteers much of his time supporting life sciences, environmental and conservation activities that directly benefit the Puget Sound region. His presentations and blogs educate, enlighten and inspire residents and visitors about helping and healing Puget Sound." 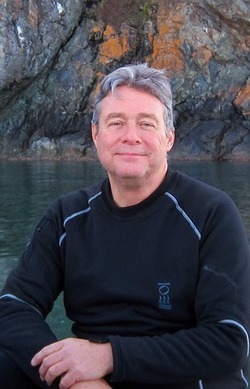 I am a professional underwater and land photographer and videographer living and exploring primarily in the beautiful emerald green murky frigid waters of Puget Sound near Seattle, Washington. Rarely am I in the water without my camera. I began exploring our underwater world in April of 2009. To date have well over 1200 hours in the water, mostly in Puget Sound, and almost all from the shore. To read an in-depth history about me, my work and my organization, read the 'Artists Profile' article. In 2015 ,my work was published in The Salish Sea: Jewel of the Pacific Northwest. December 2016 I was profiled for the 'Artist of the Week' series by Seattle Refined. Two months after becoming an underwater explorer, I purchased my first underwater camera - the Canon G10. For the money one of the very best cameras on the market. Presently I shoot with Canon 5D Mark III & 5Ds full frame dSLR cameras. I only use full frame Canon glass and feel strongly that to get the best shots you must have the highest quality lenses. My full frame housing is Nauticam. My primary focus is Puget Sound, although I also photography the greater Salish Sea, and around the world. My video projects include a new video about Lion's Mane Jellyfish, the most famous wreck in the Salish Sea: 'The Diamond Knot', and 'Stubby Squid in Puget Sound'. Other important videos include 'Giant Pacific Octopus & The Pilings at Keystone', 'California Sea Lions', and 'Predators in the Dark', my video about Harbor Seals. Learn about 'Pacific Red Octopus: Masters of Disguise', and the development of 'Kelp Greenling Eggs'. I am always working on the next cool and amazing thing. I love shooting and editing my work. Creating all of the music for each of my videos is also a fulfilling challenge. Recently I traveled to Isla Guadalupe Mexico to photograph Great White Sharks in there natural habitat. Being within only a few feet of these massive beautiful creatures was an amazing experience. View my images shot while cage diving with Great White Sharks and also other local island wildlife. My Blogs feature valuable information about some of my most interesting work, an amazing informative article about our amazing Giant Pacific Octopus, the best local spots, photography equipment, our local environment, and much more. I am scheduling local shows and events right now for 2018. Check my Art Events page for dates and locations, and if you'd like to have me speak to your organization, Connect with me and get more information on my Presentations page.